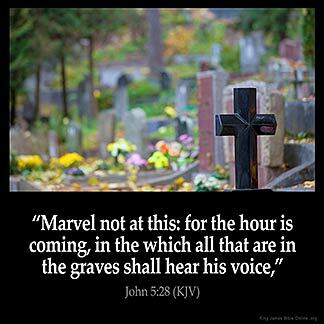 JOHN 5:28 KJV "Marvel not at this: for the hour is coming, in the which all that are in the graves shall hear his voice,"
25Verily, verily, I say unto you, The hour is coming, and now is, when the dead shall hear the voice of the Son of God: and they that hear shall live. 26For as the Father hath life in himself; so hath he given to the Son to have life in himself; 27And hath given him authority to execute judgment also, because he is the Son of man. 28Marvel not at this: for the hour is coming, in the which all that are in the graves shall hear his voice, 29And shall come forth; they that have done good, unto the resurrection of life; and they that have done evil, unto the resurrection of damnation. 30I can of mine own self do nothing: as I hear, I judge: and my judgment is just; because I seek not mine own will, but the will of the Father which hath sent me. 31If I bear witness of myself, my witness is not true. Nyle ye wondre this, for the our cometh, in which alle men that ben in birielis, schulen here the voice of Goddis sone. 5:28 The time is coming - When not two or three, but all shall rise. Joh 5:28 Marvel not at this. That he should execute judgment. Those in the graces shall hear his voice and come forth to judgment; the good, to the resurrection of life; the evil, to the resurrection of damnation; the one to life eternal, the other class to condemnation. James Njoku- Maybe 1 Peter Chapter 3: 17-22 will help you regarding John 5:28 17 For it is better, if the will of God be so, that ye suffer for well doing, than for evil doing. 18 For Christ also hath once suffered for sins, the just for the unjust, that he might bring us to God, being put to death in the flesh, but quickened by the Spirit: 19 By which also he went and preached unto the spirits in prison those that had died before Christ was sacrificed on the cross was preached to by Christ after he was crucified while he was still yet in the tomb for those 3 days. They heard Christs voice. Hebrews 9:27-27 And as it is appointed unto men once to die, but after this the judgment:---- you are making that verse harder than it is suppose to be. It means that after someone dies-you must be judged. Judgement time comes after the perishing of flesh. Although it does not come immediately after death. It comes on judgement day. I hope some of this has helped you Keep studying! Don 't give up. If you don 't understand something, pray for wisdom and knowledge from GOD...for all wisdom and knowledge comes from GOD. He is faithful. You will receive it in HIS time! Always be patient!!!! ALWAYS! Death : Hell : and the Grave : Have no dominion in me. I have been set free from all . Sin : Sickness : and Disease : I have been delivered from . If I should die today : I know in whom I have believed and am persuaded that He is able to keep that which I have committed to Him. I am saved : healed : delivered : kept in safety : and have soundness of mind. Praise God forever more !!! !